Cocina Sunae :: Closed Door | .liveit.loveit.blogit. 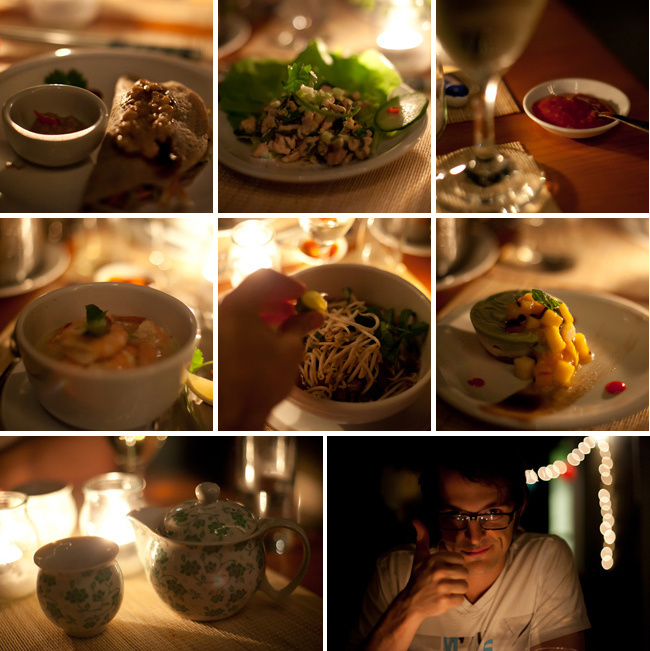 After our awesome experience at Casa Mun, we were keen to try even more closed door restaurants. We had heard lots of great (not just good) things about Cocina Sunae so decided to celebrate our 8-year date-iversary there. Unlike some other closed door restaurants, Sunae (a New York transplant) and her Argentine husband Franco’s puerta cerrada is run more like a restaurant where you arrive on your own schedule (as long as it is after 9) and dine at private tables. Immediately upon entering you see an awesome-sauce patio with a handful of tables as well as an inside dining room with several more tables. Since it was still quite warm when we arrived (shortly after 9pm) we opted to sit on the oh-so-atmospheric patio. Note to blog readers – bring a jacket so you can sit on the patio! Cocina Sunae offers at 4 course set menu without wine pairings. Instead you select wine and/or drinks independently (again, more like a restaurant). Once you’re settled in and are relaxing over your first glass of wine, the first course arrives. The weekend we visited, the first course was Lumpia Fresca, Phillipino ube crepes filled with vegetables and served with a spicy tamarind and peanut sauce. Though the sauce wasn’t all that spicy, the flavours were complex and delicious. The crepes were tasty and filled with vegetables that were cooked to perfection. We needn’t have worried about the spice. Next up we were served Laab, spicy chicken lettuce wraps tossed with fresh mint leaves, cilantro, crush roasted rice and citric dressing. I’m a bit of a tough judge on lettuce wraps, because I really, really, really love them. I mean seriously, they are like asian tacos. Asian tacos people. Not much gets better than that. These lettuce wraps weren’t quite “spicy” on their own, but Sunae brought out her homemade sriracha sauce (made from chilies from her own rooftop garden) and oh.my.god. Was it ever delicious. And spicy. So spicy that our mouths were burning. And while we may have gone a bit overboard on the sriracha, it was a perfect compliment to the lime-y, cliantro-y lettuce wraps. This dish was a big hit for me. Sunae always offers two choices for her main course, and clearly the hubs and I were going to try them both. The hubs dish: Pho, if you don’t know pho (pronounced, somewhat awkwardly, as fuh) it is Vietnamese noodle soup: rice noodle in a beef broth, served with tenderloin slices, fresh herbs, shallots, bean sprouts, hoisin and homemade sriracha hot sauce. The hubs quite liked it, but didn’t find it to be a standout. Note that he is a bit of a harsh critic when it comes to pho, due to vast quantities consumed while working in Richmond. I got the Gaeng Kiow Gung, better known in Canada as prawn green curry. At Cocina Sunae it is served with bamboo shoots, eggplant, coconut milk and basil. I loved the green curry (and it was really truly actually spicy! ), and for the first time in my entire life I enjoyed eggplant. I think I have never before eaten properly cooked eggplant. It was delicious. Finally, it was time for dessert. And on the menu, an ice cream tart: taro and green tea ice cream on a sesame seed cookie crust, topped with a fresh plums, mango and passion fruit. Taste explosion in my mouth. That is all. 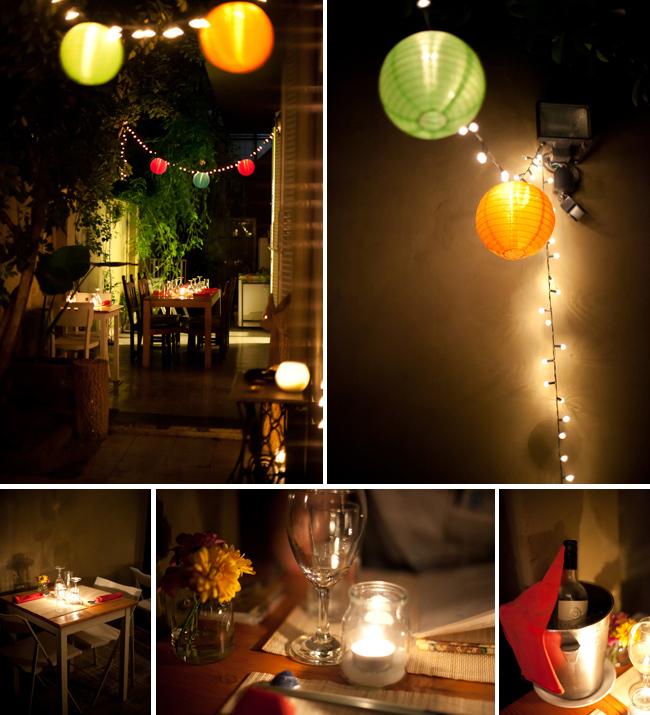 Cocina Sunae, Colegiales/Chacarita, Buenos Aires (exact address given upon reservation). At $130 pesos pp before wine (360 pesos ($85) for two including wine and tip) this meal stands out as one of the best value meals we’ve eaten in BA. The food is delicious (and the sriracha super spicy), the space is beautiful, the hosts are awesome. Go and eat there. You won’t regret it.